The CAP is a stable region of the lower troposphere that impedes convection in the PBL from occurring. 2. How is CAP determined? The CAP is determined as the maximum temperature difference between a parcel of air and the surrounding actual temperature in the lower troposphere. The CAP will always be a positive number since a CAP region has a parcel temperature that is colder than the surrounding environment. CAP is given in units of Celsius difference. This temperature difference is the amount of warming (or rather the weather conditions that will cause the parcel to no longer be colder than surrounding environment) required to produce no CAP. 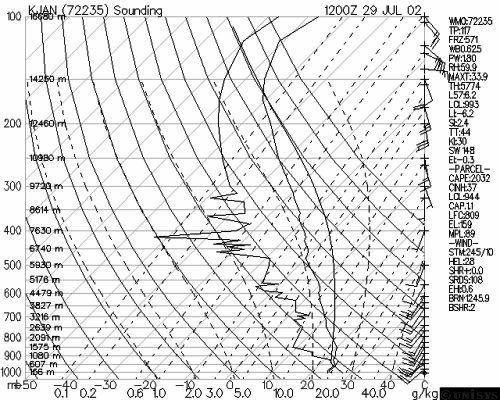 The CAP on the sounding at the bottom is 1.1 (weak for a morning sounding CAP). When the CAP is less than 2.0, storms are likely to develop shortly when the only parameter holding back convection is the CAP. When the CAP is greater than 4, help will be needed over the next few hours to break it.